Aleksandra Dziurosz is successful dancer, choreographer, teacher, founder and director of Warsaw Dance Theatre. She also works as a stage movement designer, choreography consultant in drama and opera performances. She graduated from the National Ballet School in Bytom, and Ballet Pedagogy Studies and Postgraduate Studies in Dance Theory in Academy of Music in Warsaw. 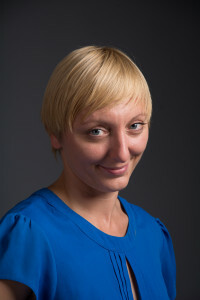 In 2009 Aleksandra received her doctoral degree and four years later her doctoral degree with habitation at The Fryderyk Chopin University of Music in Warsaw. There she is currently operating as an assistant professor and lecturer of contemporary dance and movement techniques. Aleksandra has been the choreographer and director of many performances and over 120 dance etudes. Since 2008, she is an artistic director of her own dance company Contemporary Dance Studio [Dance Studio WTT] in Mazovia Institute of Culture in Warsaw. She also founded a dance group Atelier WTT gathering people who are not professionally connected with dance. She is also the initiator and organizer of numerous theatre performances and cultural events, e.g. Warsaw Dance Days – International Festival of Contemporary Dance, program Dance Centre Warsaw, Warsaw Dance Platform festival 2014-2016, cycle of dance evenings Ciało – Sztuka – Ruch [Body – Art – Movement] and artistic events Stage on Elektoralna Street. In January 2009, she won the first choreographic award for the best of solo performance during X. International Contemporary Dance Festival Solo/Duo Dance Festival in Budapest. She is member of a jury of professional national and international choreographic and dance competitions. She is an author of the book „Phenomenon of Pina Bausch creative output“ (2005) and delivers speeches at scholarly conferences and seminars concerning history and theory of dance.